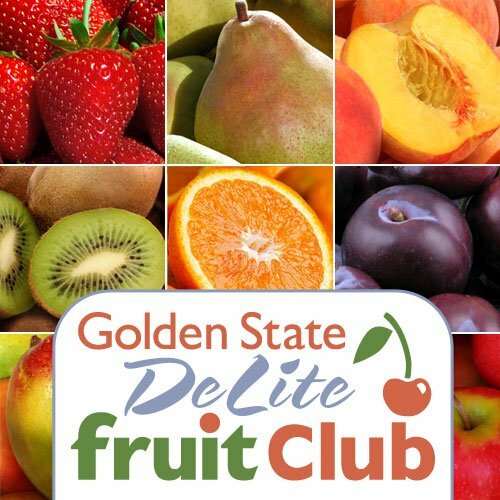 Golden State Fruit's 12-Month DeLite Fruit Club delivers 12 sequential months starting from the first delivery month and features lighter-sized samplings of the best orchard-fresh fruit of each season. Our fruit is larger and more flavorful than anything you can buy in stores! Club recipients receive a certificate detailing their gift with the first shipment. All monthly shipments also include recipes, storage and preparation tips. Full-year fruit selections for the DeLite Fruit Club is as follows - January: Cal Navel Oranges 3 lbs., February: Sumo Citrus ® 3 lbs., March: Pink Lady ® Apples 3 lbs., April: Pixie Tangerines 3 lbs., May: Colossal Bing Cherries 2 lbs., June: Golden Mango 3 lbs., July: Pearl White Nectarines 3 lbs., August: Summer Sun Peaches 3 lbs., September: Bartlett Pears 3 lbs., October: Pomegranates 3 lbs., November: Honey Crisp Apples 3 lbs., December: Red and Green Comice Pears 3 lbs.